Hello, I'm Cory! I'm a teacher of the body, the spirit and the mind. I teach self defense, martial arts, meditation, and languages to promote a holistic study of life and well-being. I also offer an apprenticeship program modeled after Zen monastery living retreats in China. Martial arts can take decades to master and are an amazing life path of self discovery, but they aren't suited for modern self defense. You need practical, useful, and simple real life techniques you can use to defend yourself on the street the day you learn them. Learning even the most basic of tools and skills for self preservation can mean the difference between getting home safe and not getting home at all. Even more important than the techniques are the strategies and mindset to help you deal with any situation. Your wit will protect you better and more often than any weapon, so we will keep it sharp too. Most martial arts teachers learned from teacher to student sometimes going back even hundreds of years. I did this too but I also did my homework. I have a Master's Degree in Asian Studies and even wrote my Master's Thesis on Martial Arts traditions. It comes in handy when students want to know why and not just how. For those who are interested in the spiritual path as well as the physical, I offer classes in meditation and mindfuless. For half a decade I lived, taught, and studied in China and Japan. I trained and taught in Zen monasteries for months at a time, learning about meditation and the teachings of Eastern philosophy such as Buddhist and Indian thought. Introductory to Intermediate Japanese language lessons! Traveling to Japan? Love Anime/Manga? Not a fan of English Dubs? Want to learn all those cool kanji? Need help studying for your test? I got you covered! Is your favorite Ninja Turtle Leonardo? Have a fascination with S-words? 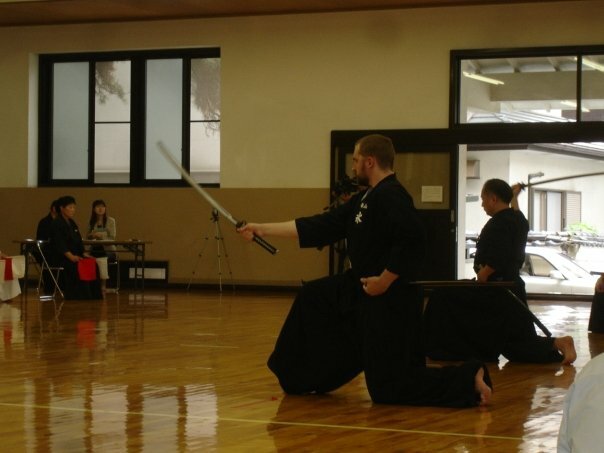 All joking aside, I have a 2nd degree black belt in Iaido, Japanese Swordsmanship. I (pronounded E) means existance, AI (pronounced I) means to meet, and DO means the way of. 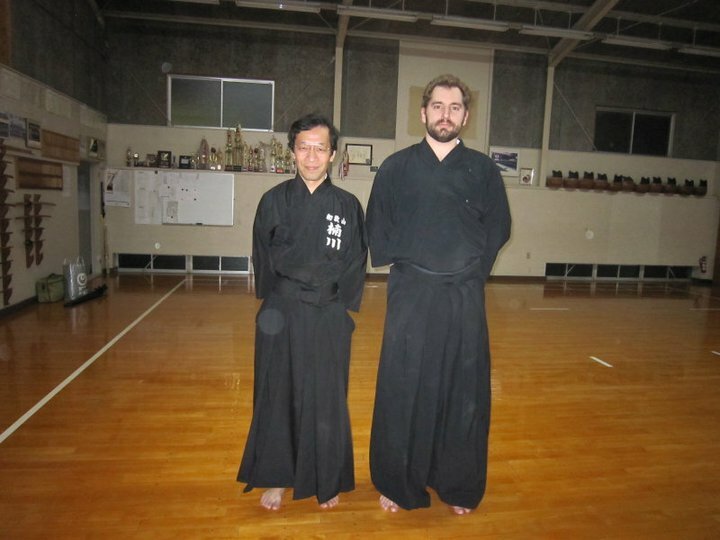 Iaido is "The way of meeting existence". It's just you and the sword; total focuced concentration. Make a perfect cut. In this class you will learn how to carry, wear, hold, respect, care for, and swing a Japanese Katana. Have you ever wanted to train with the crazy Zen master in the woods? Ever wanted to study like the karate kid with Mr. Miyagi or like Luke in the cave with Yoda? Want to find the teacher on your own personal hero's journey? Well I got news for you. You don't have to go all the way to China and climb a mountain to find one. Just to Miami....and there's no mountains. I've been a teacher my whole life; ever since pre-school when I first heard about show-and-tell. You mean I get to take the coolest thing I know in the world and show everybody about it?! It's my life. I am a professional pointer. I find amazing things in the world, learn about them, and then point others towards the best knowledge. I love the challenge of finding the right way to show students the best books, the best tricks, or even when there is no best way. That moment when a student works hard and earns the understanding. It's the best. 5 out of 5 stars. Would highly recommend. Cory is very flexible in his teaching, working with what the individual needs to better themselves rather than a generic lesson plan. which is needed yet really rare to find in a teacher these days. He also makes the learning experience fun. I attend his Krav maga class which has helped me with my self esteem and confidence. I defantly recommend his classes to anyone even remotely interested in learning self defense or meditation. Cory's great! I'm always impressed by his wisdom. I'm new to meditation and I haven't done any martial arts since I did karate in the 3rd grade. So, as you can imagine, I felt awkward at first, but that anxiety soon washed away once I started working with Cory. His laid-back attitude puts one at ease quickly. He often says during our sessions, "we don't have to be serious when we train, but we do have to be sincere with it." I've been practicing krav maga with Cory for about a month and a half now. Cory is incredibly knowledgeable about Martial arts and seems to have an answer for each hypothetical self-defense situation I could think up. He's patient and very clear when communicating ideas. I look forward to each session and I leave each time feeling empowered. I think it's important to have an idea of what to do in case of emergency, and I certainly feel like I'm learning about that with Cory. I would advise anyone interested in mindfullness, meditation, martial arts, or just self-defence to reach out to Cory. You couldn't find a better teacher in the United States. EXCELLENT and VERY WELL credential instructor in meditation, martial arts, and how these two subjects are taught. Mr. Hardaker knows how to teach. He knows the material deeply (lived in Japan for years and has been doing martial arts for 20+ years). And he is compassionate and truly cares about his students and their progress. Lets discuss your needs! Reach out! I'm here to help you! Are you looking for classes in self defense, meditation, martial arts, or an apprenticeship? Then lets figure out where you would like to meet and how often. Finally we'll set a schedule and begin your new path of mental, physical, and spiritual health! Like any skill - the more you practice the better you get! The full course will give you a well rounded idea of what to do in the most common violent situations. You will learn practical self defense theory, resisting an unarmed standing attacker, resisting unarmed attackers on the ground, and basic weapon defenses against bats, knives and guns. You'll also learn how to fight and escape from attackers in and around vehicles. Our goal isn't to win, it's to get home safe! We will practice awareness strategies and learn to use our brains to prevent and escape dangerous situations. Just the fundamentals! What are the most useful things to know? How to strike - Where to strike - When to run - What not to do! You’ll learn self defense theory, defense vs unarmed attackers how to create openings so you can get home safe! We’re gonna cram in as much as possible into one class. If you knew you had to fight an attacker today-what are the absolute need to know self defense techniques to give you a fighting chance. Wanna bring a friend? No problem, just add $15 for each additional person per class. For private lessons I give incentives for ongoing students. If you take one class but end up signing up for more lessons I'll prorate the remaining lessons to make it equal out to the lower rate. Meditation is a simple exercise for the mind, but like any skill it takes practice to get better! We will learn more than just the fundamentals! 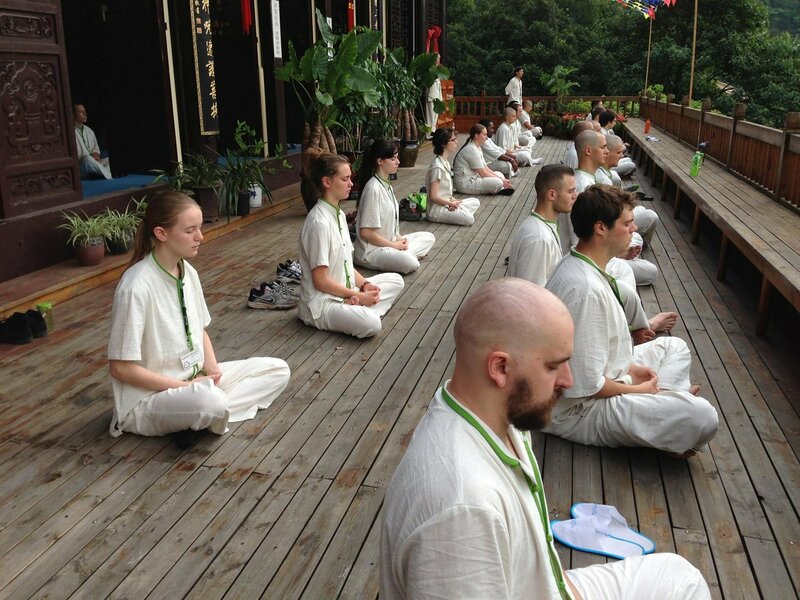 On-going students will learn a wider curriculum of meditation techniques and topics. The course will go into more depth of the various types of practices such as focus, visualizations, body scanning, moving meditations, concentration, and insight meditation. We will create a practice that works for you! These classes will cover the basics of focus meditation; learning the skill of mental discipline in concentration. You will learn techniques for how to calm the mind, how to deal with distractions, and how to practice mindfulness. For new meditators the course will cover several breathing exercises, basic postures, sitting, walking, and standing meditations. For those who need to get chill quick! This session is completely dedicated to you! You will learn what meditation is, how to do it, and give you several techniques that you can rely on again and again for the rest of your life! If you're already sufficient in your practice, I can teach you new techniques or help you hone to your mindset, so that you get the most out of your meditation! I started teaching in 2005 in Gainesville, Florida. I taught both children and adults Karate while working as the backstage manager for the US: OPEN World Martial Arts Chamionships. From 2007-2011 I taught English in Japan to children and adults. Since 2013 I've been teaching Self Defense, Language Aquisition, and Philosophy to a wide range of students. I have taught children as young as 4 years old and adults as old as 94 years old. I've taught everyone; students, professionals, people who know what they want, and people who feel lost and somewhat off the way. I have taught beginners to learn the ropes and taught experts who needed a refresher. I'm a huge fan of the Okeechobee Music and Arts Festival! I wander around teaching meditation, serving tea, and lecturing on the nature of consciousness. If you're just looking for a hobby, it doesn't matter what style you learn. What matters is that you're with good people who are worth your time. If you're looking for legitimate self defense, be aware that many martial arts advertise themselves as self defense because it pulls in revenue. Modern self defense is not the same as traditional. You can have the best teacher in the world but if you don't put in the effort you won't learn. It takes time and effort to learn anything. Believe you can. Then do it. What specifically is my goal? How will I measure if I've achieved my goal? If I put in the hard work will I achive my goal? Am I willing to put in the time to achive my goal? When will I accomplish my goal by?